Just last weekend, I wrote "Did you know MR. T is now a [Tormenting voice on some GPS devices]? Poor guy, always typecast. Why wasn't he cast opposite Jack Nicholson in The Bucket List? Where is his romantic comedy career?" I can't tell you how delighted I was to discover in the (incredibly showy) closing credits of Cloudy With a Chance of Meatballs that it was Mr. T who played the heroic cop/dad in hot pants. Cute movie. Anna Faris was good as the female lead. 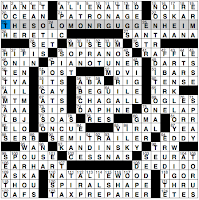 Liz Gorski's New York Times crossword, "Ahead of the Curve"
What a tour de force crossword. It marks the this week's 50th anniversary of THE SOLOMON R. GUGGENHEIM / MUSEUM, which was the FINAL MAJOR WORK OF / FRANK LLOYD WRIGHT. The building has a NONTRADITIONAL / SPIRAL SHAPE, mimicked by the spiral pattern in the crossword grid. But that's not all: There are also nine artists' names in the grid, each clued with the title of his work of art in the Guggenheim. They go from 1-Across—MANET, ["Before the Mirror"]—down to ARP at 112-Down, ["Head and Shell"]. I have no idea if the painters' names reflect the pictures' locations in the museum. • 94A. An EDDY is a [Water swirl]. Appropriate for the swirling grid, no? • 36D. HOT TAMALES are [Good lookers]. • 47A. [One who works on a grand scale?] is a PIANO TUNER. Also musical: the SOPRANOS right above this answer ([2000s TV family]). • 27A. The SANTA ANA is a [California wind]. Nice to see this go beyond [Santa ___]/ANA. • 110A. NATALIE WOOD was a ["Rebel Without a Cause" actress]. 39D: SISSY SPACEK is the [Player of one of the women in Robert Altman's "3 Women"]. • 89D. BAUHAUS, another art/architecture term, is clued as a [School popular in the 1920s]. • 42D. FABERGE is a [Jewelry firm since 1842]. Gotta love a Fabergé egg. • 108A. Mystifying until all the crossings pulled it together, "'DEED I DO" is a [Jazz standard whose title is repeatedly sung after "Honey..."]. • 99A. I like the fancy clue for SPOUSE: [Clytemnestra, to Agamemnon]. It's getting late and I need to throw this post up, so I'll leave off here. 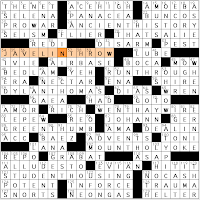 Merl Reagle's syndicated crossword, "Vowel Play"
• 21A. [Additive advice?] is WATCH YOUR STP. STP is a motor oil additive, something like that, and STP is step minus its vowel. • 27A. [Where to hear songs with subliminal messages?] is ULTERIOR MTV (motive). • 41A. [Two things not to mess with in the Old West?] are THE LONE RANGER AND TNT (Tonto). • 57A. THE VCR OF WAKEFIELD (Vicar) is a [Way-ahead-of-its-time novel of 1766?]. • 70A. The Continental Divide turns into THE CONTINENTAL DVD, or [Certain airline's in-flight movie?]. • 87A. [Old ABC series about a paramedic?] is HANGIN' WITH MISTER CPR (Hangin' With Mr. Cooper]. Omigod, I used to watch that show! I forgot all about it. Gotta dock Merl a couple style points for the substitution of MISTER for Mr., though. • 104A. [Top two sellers at the Trail Mix Deli?] are NUTS AND BLTS (bolts). • 111A. [Banned Britney Spears song?] clues "OOPS, DDT AGAIN" ("Oops, I Did It Again"). The VCR and DDT answers made me laugh. Merl probably has a higher yield of laughs per puzzle than any other constructor (though the pun haters will replace the laughs with groans—and probably get more groans per puzzle with Merl than with anyone else). How about five other clues? REEFER isn't just a joint or a jacket; it's also 53A: [Chilly rail car] whose name derives from "refrigerator." 6A: [Leeward Island] takes us to BORA BORA. ANTIDOTE is clued as 82D: [Toxic avenger]; cute! SPECIAL K breakfast cereal is a 86D: [Rival of Total]; this answer recently had a druggy clue in one of Brendan Quigley's puzzles. We've got a French three-fer; 42D: [Sceaux student] is ELEVE, 43D: [___ de triomphe] is L'ARC, and 68D: [1980s tennis star Jose-Louis] CLERC is really...not very well known. Make it a four-fer: GALOPS are 36A: [France's old dances], too. No, five: UNE is 107A: [Antoine's "a"]. Shall we dock Merl another point for having ELEV. and ELEVE in the same grid? Hang on, this puzzle has the wrong title! It should be "UPS" because the theme is brown: Eight long phrases include shades of brown. We have CHOCOLATE LABRADOR, SIENNA MILLER, DUN AND BRADSTREET, ALFRED HITCHCOCK'S TOPAZ, I'D LIKE TO PROPOSE A TOAST, COFFEE TABLE BOOKS, THE GREAT SEAL, and the unlikely pair of DAN BROWN AND AMY TAN. Odd little big theme, isn't it? CHOCOLATE means brown here, whereas the other theme entries aren't using their brown hues as colors. Isn't TOPAZ more golden yellow than brown? Is there an overriding scheme here beyond "they're all shades of brown"? I dunno, this one leaves me wishing for more. 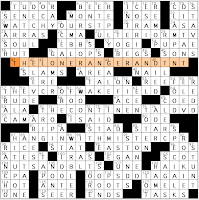 Alan Arbesfeld's syndicated Los Angeles Times crossword, "The Ultimate Sandwich"
When my husband makes the Ultimate Sandwich for our son, here's how it goes: He stacks two pieces of bread in the toaster oven, toasting one side and keeping the other soft and crumb-retardant. Then comes the dual slathering on the crunchy sides: peanut butter and jelly. Next, a smattering of chocolate chips, which get melty on the toast. Then it's smooshed together and served with a cold glass of milk. In this puzzle, "The Ultimate Sandwich" refers to the ultimate degree, the NTH degree, that's sandwiched inside each theme entry. For example, ANCIENT HISTORY, or [Course covering the Roman Empire, perhaps], and MOUNT HOLYOKE, [One of the Seven Sisters colleges]. The eight theme answers are straight phrases clued straightforwardly. The whole venture seemed rather dry—no grand swaths of stacked fill, no super-colorful answers, no humor in the theme, and easy clues overall having little bite. 1-Across set the tone: [Place to surf] clues THE NET, which feels about 10 years out of date as common parlance. Go ahead and Google it—the first hits are for the 1995 movie by that name. Bruce Venzke and Stella Daily's CrosSynergy/Washington Post "Sunday Challenge"
I like to see constructors stretch and try their hand at low-word-count puzzles, but sometimes they run afoul of my Patrick Berry Rule: If you're not Patrick Berry and you dip down to 64 words (or less), the odds are high that the fill will contain too many "roll your own" words with prefixes and suffixes that feel clunky. Let's start with what I liked. Cool grid design, with 6s, 7s, and 8s stacked up the wazoo. The full name DORIS DAY ([Calamity Jane portrayer, in 1953]) is nice, and MT. ARARAT ([Resting place in Gen.]) kept me guessing until the crossings finally made it clear it began with MT. "Resting place" x 6 letters = ARARAT as a gimme, but with 8 I was thinking unknown burial site in the Bible. FUNK is clued as ["The ___ of forty thousand years" ("Thriller" lyric)]—just saw the trailer last night for Michael Jackson's rehearsal concert movie and it actually looks entertaining. In the "roll your own" category, alas, there is more. Two odd jobbers: some DICERS ([Cooks, at times]) and a ROAMER ([Footloose one]). 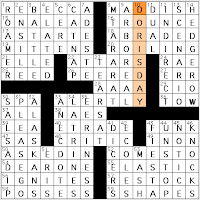 MADDISH is clued as [A little crazy], and no, I've neither used nor encountered this word before. Also in the fill: ROILING, ALERTLY, RESTOCK (though this word is rock-solid), EERINESS, PEERED (ordinary but undistinguished), and UNSTOP (this one's also rock-solid). There are a few verb + preposition phrases, and some oddball phrases like DEAR ONE ([Close friend, e.g.]) and ON A LEAD ([Way to walk one's dog]). 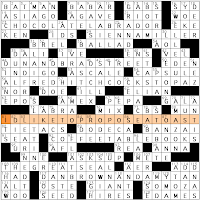 Unless it's a dance term, I say no to SALSA DIP—this one keeps showing up in crosswords but sounds awkward every time. Constructors, is this phrase in your database? I had no idea what the [Swelling on a bird's beak] was—it's CERE. I'll bet Trip and Al and Ellen knew that one, but I didn't remember it from the heyday of crosswordese (Eugene Maleska, R.I.P.). I've said it before and I'll say it again: A themeless puzzle with a much higher word count is usually so much more entertaining than a low-word-count creation (unless you're Patrick Berry or a handful of others). I can marvel at a technical achievement, sure, but first and foremost I want to be entertained and challenged.